17. Hjortjolm (Hjortholm). Ruins from a castle that was destroyed in 1535. 18. Frederiksdal (Frederiksdal). This is the point of departure for sailing and boat rentals. The powerhouse is all that’s left of the old Frederiksdal Mill which dates back to the 16th century. 19. Frederiksdal Castle (Frederiksdal Slot). This beautiful white rococo mansion from 1745 is designed by Nicolai Eigtved, and was built for Johan Sigismund Schulin. Unfortunately the castle is not open to the public. 20. Sophienholm (Sophienholm). This is the country home which was built in 1769 by the general post manager Theodor Holm. The French architect Joseph-Jacques Ramée rebuilt the home in 1805. Today the home has many temporary art exhibitions. During the summertime the garden is the centre for music concerts, and other forms of entertainment. There are also small art exhibitions in the tiny side building. Amongst the artists represented are two of Denmark’s leading artists from the 20th century (Asger Jorn and Carl-Henning Pedersen). 21. Bagsvaerd Lake (Bagsværd Sø). The lake covers 119 hectares, and is 3.5 meters deep. The lake is connected to Lyngby Lake (Lyngby Sø). In the summertime the lake is often used for rowing competitions. 22. Aldershvile Castle Park (Aldershvile Slotspark). This park around the former country home ‘Aldershvile Castle’ which was built in 1780. The castle burned down in 1909 and was never rebuilt. 23. Lyngby Lake (Lyngby Sø). The lake covers 58 hectare and is 3.3 meters deep, and it is a very popular area for canoes, kayaks and fishing. There are two islands in the middle of the lake, Storeholm and Lilleholm. 24. Lyngby Amose (Lyngby Åmose). 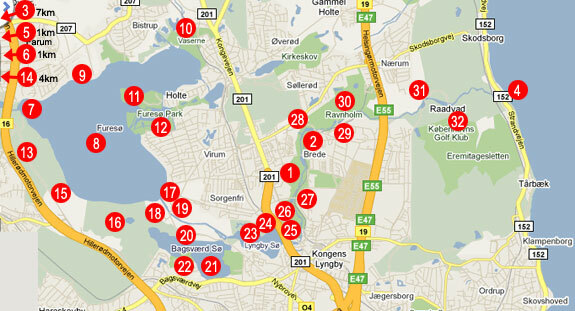 Lyngby Amose is an exciting marshland with an extensive channel system. North of the marshland is an 800 years old oak tree named after the German poet Friedrich Gottlieb Klopstock (1724-1803). Friedrich lived in Denmark for 20 years, and many of his poems were inspired by the nature around Lyngby.